Recent release “N. 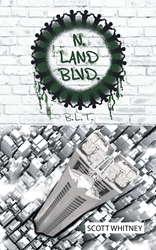 Land Blvd.” from Page Publishing author Scott Whitney is an all too realistic tale of city on the brink of collapse, with corruption and organized crime running rampant. But a breath of hope enters the scene as a mysterious young teen rounds up an army of orphan children to reclaim the city. Scott Whitney, a creative and gifted writer, has completed his new book “N. Land Blvd.”: a thrilling and mysterious tale of a young man and his unlikely army as they are poised to save a city from a corrupt government and police force. Published by New York City-based Page Publishing, Scott Whitney’s fantasy is the engrossing story of a fantastic and faltering society. N. Land City is dying, hitting its peak of development as it now falters on the brink of anarchy. The Jungle grows with every passing month with no explanation how the problem even started. The police and government officials have grown thick with corruption. The idea to protect and serve is lost and forgotten. Organized crime has swelled the streets to the point of swallowing up the last remaining purity that once was. With the alliance of corrupt cops and the Hidden Hand of the City coming to a close, dreams and inspiration change to utter survival. The citizens fear that the days of N. Land City are coming to an end. The only constant goal the Captain could ever remember was ruling the city he grew up in. The path became darker with every step he took to achieve his dream. He had worked hard to come as far as he had. He was willing to go deeper still if it meant he would be on top at the end. The questionable acts the Captain was forced to do over the years were only a necessity in his eyes. He would do them again if it helped his cause, to become the Hidden Hand of the City. There were only two remaining things standing in his way. The orphans were barely surviving when the kid showed up. None of them knew where he had come from. They didn’t care to ask. The mysterious teenager had experience and knowledge that none had ever seen. For the kid in the green hoodie, survival wasn’t enough. He had a plan to change everything, not just for the orphans but for everyone caught in the middle of N. Land City. The game to be played wasn’t going to be easy. If the kid and his gang of orphans were able to win, then the city might have a chance to thrive again. It would all start with the downfall of the Captain and the corruption that followed in his wake. Readers who wish to experience this delightfully intriguing work can purchase “N. Land Blvd.” at bookstores everywhere, or online at the Apple iTunes store, Amazon, Kobo, Google Play or Barnes and Noble.